"After reading Teaching to Transgress I am once again struck by bell hooks's never-ending, unquiet intellectual energy, an energy that makes her radical and loving." -- Paulo Freire In Teaching to Transgress,bell hooks--writer, teacher, and insurgent black intellectual--writes about a new kind of education, education as the practice of freedom. 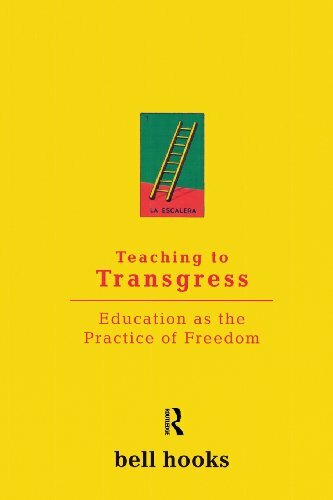 Teaching students to "transgress" against racial, sexual, and class boundaries in order to achieve the gift of freedom is, for hooks, the teacher's most important goal. bell hooks speaks to the heart of education today: how can we rethink teaching practices in the age of multiculturalism? What do we do about teachers who do not want to teach, and students who do not want to learn? How should we deal with racism and sexism in the classroom? Full of passion and politics, Teaching to Transgress combines a practical knowledge of the classroom with a deeply felt connection to the world of emotions and feelings. This is the rare book about teachers and students that dares to raise questions about eros and rage, grief and reconciliation, and the future of teaching itself. "To educate is the practice of freedom," writes bell hooks, "is a way of teaching anyone can learn." Teaching to Transgress is the record of one gifted teacher's struggle to make classrooms work.